What changes will make the 2019 Honda CR-V different? Possible addition of a gas-electric hybrid model to the lineup of Honda’s best-selling vehicle. It would join hybrid versions of the Nissan Rogue, Toyota RAV4, and Mitsubishi Outlander as the only gas-electric entries in the compact-crossover class, one of America’s fastest growing automotive segments. Along with the possible addition of a sporty SE trim level, it would be the main change of note for the 2019 CR-V. This five-seater is still fresh from a model-year 2017 redesign that updated styling, improved fuel economy, and expanded availability of key safety and convenience features. The ’19 CR-V is a prime candidate for a hybrid drivetrain. Honda is committing to electrification of its cars and crossovers. The company’s goal is to have two-thirds of its sales come from hybrid, plug-in hybrid, and zero-emissions (battery-electric and fuel-cell) vehicles by 2030. That’s an ambitious goal. Rival Japanese automaker Toyota is giving itself until 2050 to go majority hybrid or fuel cell. Although the current CR-V is one of the most fuel-efficient compact crossovers, the addition of a hybrid would enhance its credentials among green-minded shoppers. It would also become more competitive against top rivals, the Rogue and RAV4, which are the only competitors that outsell the CR-V. Outlander goes a technological step further, with a plug-in hybrid, but the Mitsubishi is by a wide margin the lowest-selling vehicle in the segment. Because you want to be among the first to own the new hybrid. We expect it to use a conventional gas-electric drivetrain, most likely the Two-Motor Intelligent Multi-Mode Drive system borrowed from the redesigned 2018 Honda Accord midsize sedan. Like the Toyota RAV4 Hybrid, the electrified CR-V will be the most powerful model in its lineup. It will also be the heaviest so don’t count on acceleration being significantly faster than its gas-only counterpart. Honda will likely offer the 2019 CR-V Hybrid in three trim levels, EX, EX-L with Navigation, and top-line Touring. Vaguer is whether the hybrid would be offered in both front-wheel drive and all-wheel drive (AWD). It could mirror the gas-only CR-V, where front-wheel drive is standard and traction-aiding AWD is optional. Alternatively, Honda could follow Toyota’s lead and make the hybrid AWD only. Headlining changes to the balance of the 2019 CR-V lineup would be the possible addition of sport-themed SE model. It would likely slot above the returning base LX and volume-selling EX grades. Rounding out the gas-only model roster would be the EX-L, EX-L with Navigation, and Touring. CR-V’s mid-lifecycle freshening, where we could see more significant styling, powertrain, and feature updates, will likely happen for the 2020 model year. If you appreciate the CR-V’s collection of class-leading assets, and don’t care about the hybrid model, absolutely. It might not be tops in every objective or subjective measure, but we think the CR-V has most every attribute that compact-crossover buyers need. It has ample passenger and cargo room, excellent fuel economy, and first-rate road manners, all backed by a brand with a sterling reputation for reliability and high resale value. Purchasing a 2018 CR-V instead of a ’19 will help you avoid any year-over-year price inflation for what will essentially be a repeat design. It’ll also potentially give you an extra year before this generation CR-V gets a midlife refresh to styling and possibly features. Honda does a remarkable job balancing supply and demand while maintaining highly competitive pricing. Unlike Ford, General Motors (Chevrolet, GMC), Nissan, or Toyota, you aren’t liable to see significant incentives on this crossover, even during model-year closeout season. This fact didn’t dissuade more than 375,000 shoppers from choosing a CR-V in calendar 2017, nor should it do the same for you. Put one at the top of your list. Not for most models. The current-generation CR-V debuted for model-year 2017, adopting a more muscular profile than the 2012-2016 version. Gone was the previous models’ receding chin and smiling face in favor of a more pronounced jawline, a sweeping grille, and flared body sides. Visual differences among the trim levels should repeat, with 2019 CR-V LX models again distinguished by 17-inch alloy wheels and black exterior door handles and trim. If Honda were to add an SE model, it would likely include a unique 18-inch wheel design, lower body aero addenda, a more prominent rear spoiler, and the visible dual exhaust outlet from the Touring model. EX grades would continue with 18-inch alloys, plus fog lights, exterior mirrors with integrated turn signals, and body-colored trim. Automatic LED headlights would likely remain a Touring exclusive. Gas-only Touring grades would continue to include visible chrome-tipped dual exhaust outlets; hybrid Tourings would likely hid the exhaust ports from view. Honda engineers borrow the CR-V’s underskin structure from the 2016 Civic compact car and apply a smartly packaged, squared-off body. Headroom is generous front and rear and back-seat legroom is a limousine-like 40.4 inches. 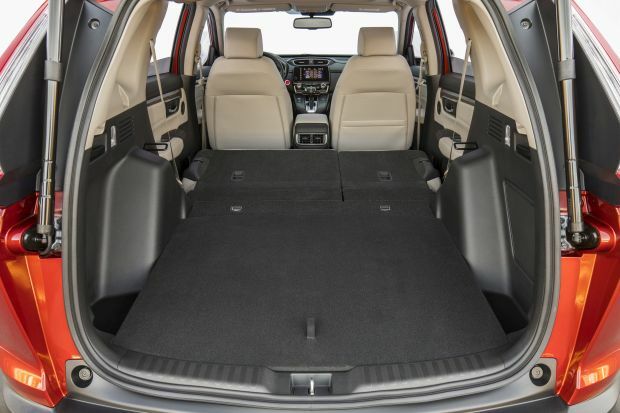 There’s copious interior storage space, and cargo volume rivals some midsize-class entries: 39.2 cubic feet behind the rear seatbacks and 75.8 with them folded. None of that will change for 2019, and neither will the interior’s attractive design. The LX would return with a 5-inch central dashboard screen with support for Pandora streaming audio. EX and higher grades would upgrade with a 7-inch touchscreen with support for satellite radio, SMS text messaging, Apple CarPlay, and Google Android Auto. They would also have two front USB charging ports and two for rear-seat passengers (LX models would have only one for the whole car). Imbedded GPS navigation would return as standard on the EX-L with Navigation and Touring. Honda deserves kudos for replacing the previous-generation CR-V’s fussy rocker switch with an “old fashioned” volume knob. Only if Honda launches the CR-V hybrid. That model would employ a gas-powered 2.0-liter four-cylinder engine and at least two battery-powered electric motors. Combined output would be around 212 horsepower. If Honda follows Toyota’s path, there would be a third electric motor at the back, which would handle power delivery to the rear wheels in place of a traditional driveshaft. It would only activate when sensors detect slippage in the front wheels. The 2019 CR-V hybrid would not be a plug-in and therefore would not make it possible to acquire an initial battery charge from a residential or commercial outlet. That would cut down on its electric-only range, but also mean lower prices and less weight. As a conventional hybrid, the CR-V hybrid would recharge its onboard battery pack by capturing energy otherwise lost during braking or coasting. Whether or not Honda adds a hybrid, the rest of the 2019 CR-V line is almost certain to return mechanically unchanged. The LX would reprise a 2.4-liter four-cylinder engine with 184 horsepower and 180 pound-feet of torque. Other models would continue with a 1.5-liter turbocharged four-cylinder with 190 horsepower and 179 pound-feet of torque. All 2019 CR-Vs, hybrid included, would have a continuously variable automatic transmission (CVT). Expect the gas-only models to again furnish adequate acceleration. The LX’s 2.4-liter engine feels a bit quicker than the turbo 1.5 from a standing start, but the turbocharged engine produces more punch after a car length or two. These aren’t the quickest compact crossover, but won’t leave you wanting for more muscle – in most situations. The exception is that lack of grunt from a stop with the turbo; overlook it and it may cause a moment of worry if you need to pull out into fast-moving traffic. No concerns about handling: the ’19 CR-V should remain among the very best in class. Steering feel is exemplary, the body stays composed in quick changes of direction, and the brakes are reassuring. Ride quality is fine — not as supple as the Nissan Rogue but not as firm as the Mazda CX-5. The 18-inch tires on EX and above allow a few more bumps to intrude into the cabin than on the LX. The larger tires also produce a bit more noise on coarse pavement. None of these issues are deal breakers. An SE version might have a firmed-up suspension, maybe tighter steering and handling-oriented tires, all aimed at further-improved road manners at a cost of some ride comfort. Only if the hybrid comes to fruition. Assuming the hybrid is AWD only, figure on EPA ratings of something like 32/38/35 mpg city/highway/combined. And don’t put it past Honda’s engineers to achieve a 40-mpg highway rating. Stay tuned. Otherwise, expect the 2019 CR-V to retain its 2018 fuel-economy ratings. For the LX with the 2.4-liter, that means 26/32/28 mpg with front-drive and 25/31/27 with AWD. Anticipate models with the 1.5-liter turbo to again rate 28/34/30 mpg with front-wheel drive and 27/33/29 with AWD. All 2019 CR-Vs would use regular-grade 87-octane gasoline. Unlikely, although we’d urge that the Honda Sensing suite of safety features be made standard on the LX model, as it is on the other trim levels. The suite consists of adaptive cruise control that can maintain a set distance from traffic ahead, blind-spot and lane-departure warning with automatic steering correction, and most critically, autonomous emergency braking that can bring the CR-V to a stop to avoid a frontal collision. 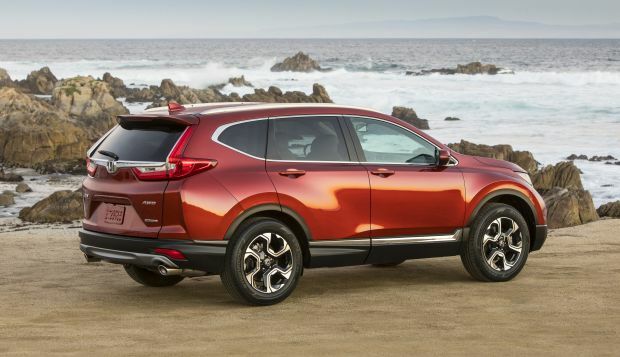 Making Honda Sensing standard on the LX would mean the 2019 CR-V matches the rival RAV4, CX-5, and Rogue as the only compact crossovers that for model-year 2018 came with a similar suite of driver-assistance features standard on every trim level. Note that Honda doesn’t offer individual options, instead equipping its vehicles with a set of features that escalates as you ascend the model line. Even without Honda Sensing, the 2019 LX would be reasonably equipped, coming standard with a full complement of power accessories, a rearview camera, Bluetooth connectivity, automatic climate control, capless fuel filler, remote entry, and a heated rear wiper de-icer. An SE model would likely have similar convenience features but add a sport suspension and unique wheels and trim. 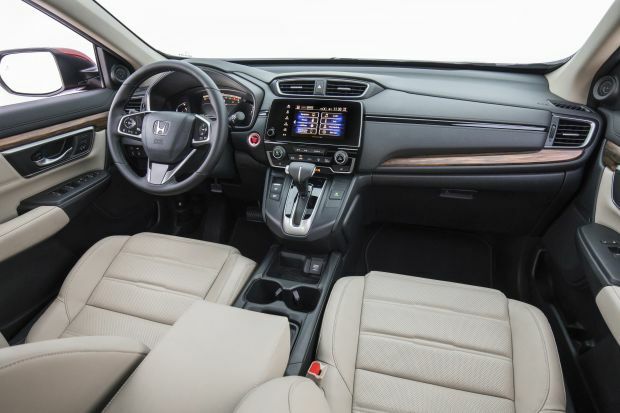 Moving up to the EX would again net Honda Sensing, the larger infotainment screen, CarPlay and Android Auto with extra USB ports, heated exterior mirrors and front seats, power driver’s seat, power sunroof, remote engine start, and a rear cargo cover. 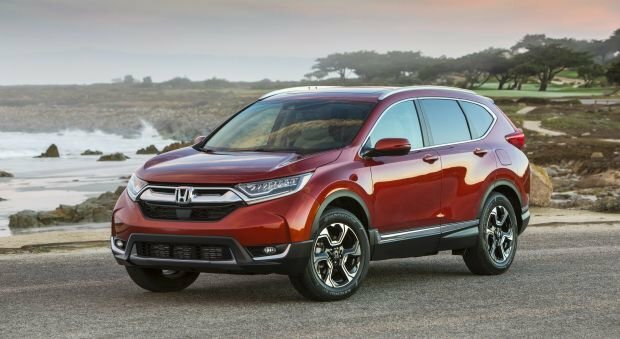 Leather upholstery, driver-seat memory, power front-passenger seat, power rear liftgate, and an auto-dimming rearview mirror would be part of the 2019 CR-V EX-L.
Touring models would again get LED interior lighting, full LED headlights, a hands-free power liftgate, rain-sensing windshield wipers, and a 330-watt, 9-speaker audio system. Expect hybrid models to align with their gas-only counterparts in terms of features. The only factory option for any CR-V will likely remain imbedded navigation for the EX-L that can display mapping data without the need for a connected smartphone. Per Honda policy, vehicles so equipped will be priced as separate trim levels. They’re almost certain to increase, even if Honda includes no new features on carryover models. Note that our pricing estimates include destination fee, which was $975 on the 2018 CR-V.
For gas-only models, expect the LX to be priced at sticker price of about $25,275 with front-wheel drive and $27,200 with AWD. We estimate an SE version to cost $26,100 with front drive and $27,900 with AWD. The EX would list for around $28,100 with front drive and $29,950 with AWD. EX-L would cost about $30,600 with front-drive and $32,400 with AWD; add another $1,000 for imbedded navigation to create what Honda calls the EX-L w/Navi. Estimated price for the 2019 CR-V Touring is $33,850 with front-drive and $35,700 with AWD. If there’s a 2019 CR-V Hybrid, expect it to carry a $2,000-$2,500 premium over the comparable gasoline trim levels. Release date for gas-only 2019 CR-V models is fall 2018, with any possible hybrid following a few months after.